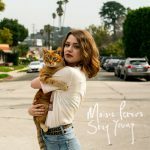 Cool Cover: Maisie Peters‘ “Stay Young”Details: Brighton, England’s Maisie Peters poses on this cover with an orange tabby. I love her belt too. Photographed by Dan Curwin, who has snapped stars such as Lorde, Peters looks so calm with that kitty.